In most cases if you need to support linking of more than one ID from one table into another table, you would use an intermediary table, this allows any number of links to be established and details of each link can be supplemented with additional details. 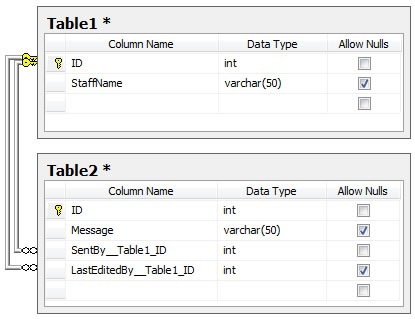 However when maintaining and upgrading an existing database that has been around for many years, or even designing a new one, were there will only ever be a need to link in a specific number of IDs, it may be the case that the IDs are placed within the other table directly. Doing this prevents the ability for SQL to use the ON DELETE CASCADE and ON DELETE SET NULL from working. Indeed even if there is only the one ID linked in, but there is more than one round table link you cannot have multiple ON DELETE CASCADE foreign keys established between the tables because it will also fail. Both these examples give the error “Error message 1785 occurs when you create a FOREIGN KEY constraint that may cause multiple cascade paths”. I recently embarked on upgrading an existing database to include foreign keys relationships (previously controlled by software only), so that we could introduce full support for merge replication. The database includes over 360 tables with around 860 relationships to be establish between tables, it is used by over 4500 users in a large number of organisations, with around 70 modules (or applications) accessing the data. As the applications have been designed and written over the past 10 years by several developers there is no way to guarantee that all the relationships between tables are being enforced correctly… Leaving aside the creation of the FKs and the verification of existing data for another blog, I needed a way to maintain compatibility with all the applications currently using the database. The only way to do this while properly enforcing the foreign keys would be to delete or set to NULL the appropriate linked data on deletion of a row, rather than rely on the application to perform the action. Having searched for quite a while I found that there was many examples of people recommending using an INSTEAD OF DELETE TRIGGER, to accomplish it, though I could not find any examples. After searching for some time the only examples I found contain hard coded references to linked tables. This is no way ideal and would be a nightmare to maintain with over 860 foreign key links between over 360 tables, which are added to and modified on a regular basis as the applications continue to grow. Anyway to cut a long story short and get to the code I wrote a TRIGGER that would satisfy my needs, based on a few assumptions. If a Foreign Key column is nullable I am assuming it is not dependant on the Primary Key data and should be set to NULL rather than deleted. If the Foreign Key does not support NULLs then the data must be dependant on a valid link and will be deleted… obviously in this case I am assuming that all of the FKs that do not support NULLs are not to be set to a default value from the PK table. Within the TRIGGER I am will be checking if the FK constraint has a referential action, is disable, is trusted (enforced) and also isn’t a link back to the PK table itself. The Trigger is designed to fail if fired against a table that has a multi-column Primary Key. Now I am a bit short of time tonight so I am just going to just show the source of what I have done and assume you will be able to interpret it…. The trigger will cycle through all Foreign keys based on the tables name and the primary key column name. It then deletes or updates the dependant data as appropriate, as it does so (assuming the same trigger is on the dependant tables) if the dependant tables have an update or delete trigger on them it will in turn trigger that causing a cascade effect… As a result of this it could potentially result in a long loop so needs to be used with caution and the database’s foreign keys need to be established carefully. You should not use this trigger if you are unsure, and I bear no responsibility for any data that is lost as a result of it’s usage! The trigger is based on T-SQL for MS SQL Server 2005, INSTEAD OF DELETE does not work in MS SQL 2000 and I have not tested it on MS SQL 2008. — actually have something to delete! — that Key should be enforced. This entry was posted in Microsoft SQL Server Scripts and Development by Paul Bunting. Bookmark the permalink.